Frederick Luis Aldama on “Latinx Comics: Geometric Storytelling, Production, and Consumption"
Aldama will unzip his brain, offering a multimedia extravaganza of US Latinx comics as explored in and through pop culture. 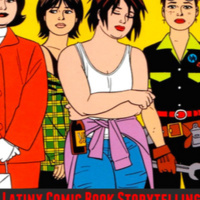 He explores how Latinx created comics vitally complicate and enrich our understanding of Latinx identity and experience and powerfully add to and actively shape the history of comics. Along the way Aldama presents a dynamic model for understanding Latinx subjects as active transformers of the world we live in today. Frederick Luis Aldama is Arts & Humanities Distinguished Professor of English and University Distinguished Scholar at The Ohio State University. He teaches courses on Latino comics, film, and other cultural phenomena. He is the author, co-author, and editor of over thirty books. He is founder and director of the White House Hispanic Bright Spot awarded LASER (Latinx Space for Enrichment Research) as well as recipient of the Ohio Education Summit Award and American Association of Hispanics in Higher Education’s Outstanding Latino/a Faculty in Higher Education Award. In 2017, Aldama was awarded the Alumni Award for Distinguished Teaching and inducted into the Academy of Teaching. He was recently inducted into the Society of Cartoon Arts. Presented by the School of Art, Media, and Technology at Parsons School of Design. FREE: limited seating, first come first served.